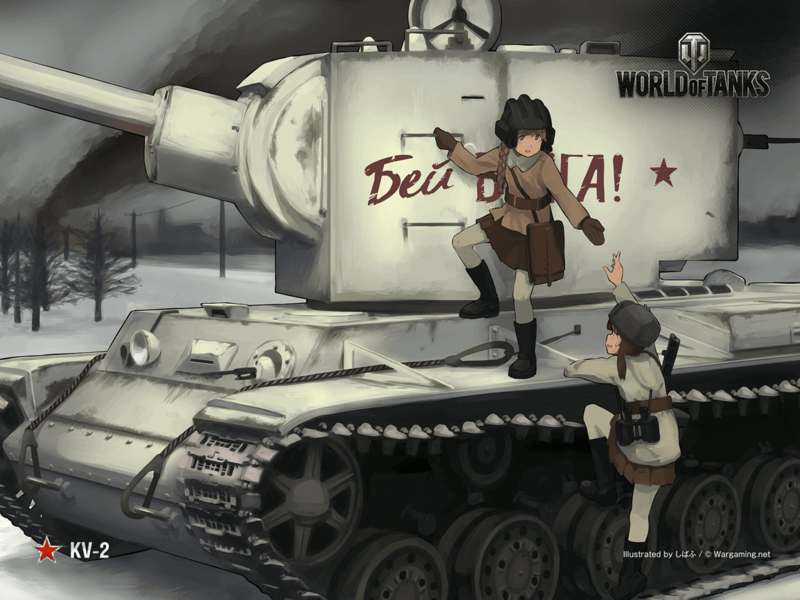 This latest illustration column is a collaboration between World of Tanks and Shibafu, a popular Japanese illustrator known for his unique style and detailed portrayal of weapons. The eighth installment features the peculiar looking tank with the gigantic turret and large-caliber 152 mm howitzer, the KV-2! The tank is known for episodes such as the standoff at Raseiniai on the description of the Epic Achievement, Raseiniai Heroes Medal. We have prepared a wallpaper version, so feel free to decorate your desktop with it! The KV-series tanks came about as a result of field experiments during the Winter War against the Finnish. During the war, Prototype KV-1 tanks were sent to the front and came back with promising results. Upon seeing this, Soviet high command decided to create a fire support variant, a “large-turret KV” with a heavy howitzer mounted on it. In order to bring the greatest possible firepower to the front, the KV-2 was originally intended to carry the 203 mm gun. However, it was discovered that this was too heavy, and the 152 mm howitzer M-10 was chosen instead. The gun was capable of firing high-explosive, armour-piercing, and fragmentation shells that weighed over 50 kg each, as well as anti-concrete shells that weighed around 40 kg. The armour-piercing shell could penetrate 72 mm of armour at a distance of 1,500 m. The fact that the Soviets managed to mount this huge gun on a fully-traversing turret is itself a remarkable feat. The ammunition, however, had a separate shell and charge. This meant that the turret required two loaders, which meant that the turret had to be rather large. This large turret made the vehicle unbalanced, and made the turret unable to rotate due to its sheer weight if the tank was on any kind of slope. 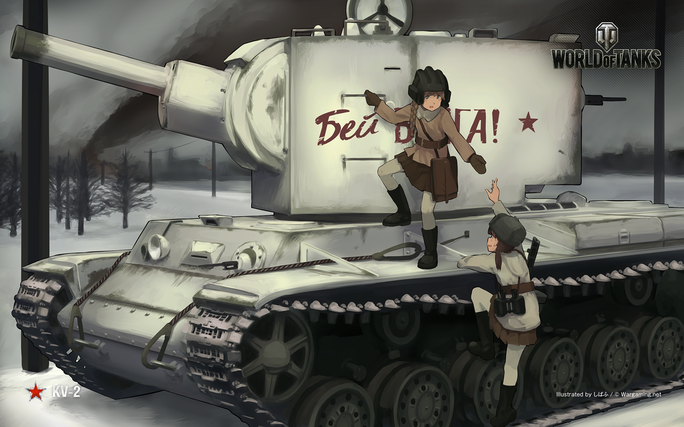 As if that was not enough, the KV-1 was already plagued with transmission problems. The KV-2 added 5 more tons onto the same system, hampering the mobility of the vehicle. The tank worked well against immobile enemy fortifications, but against more agile German tanks, KV-2’s transmission and suspension often failed before putting up a decent fight. The KV-2 was discontinued soon after the German invasion, and only 334 vehicles were built. Instances such as the legendary standoff at Raseiniai made this tank famous, but practically speaking, the KV-2 was a failure. The powerful 152 mm gun, however, was a favourite amongst soldiers on the front. 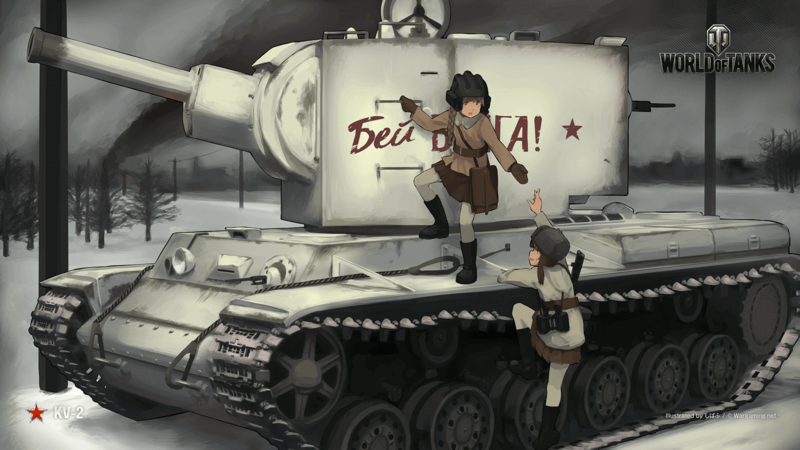 In this manner, the KV-2 paved way for more successful vehicles such as the SU-152 and the ISU-152. Check out Military Advisor Tadamasa Miyanaga / Phalanx's updates on Facebook ! Check out this vehicle on the Tankopedia! Please select the resolution that matches your screen and download the wallpaper from below. For personal use only. Unauthorised redistribution or use of the wallpaper is forbidden.